We’ve already looked through some of the key aspects of a motorbike in terms of safety and here we continue our run through on how to buy the safest motorbike. When looking at your first or next bike, top speed is a consideration when you’re thinking about safety. Obviously, if a motorbike has a top speed of 190mph, it’s a powerful machine and one that might be a bit too much to handle for somebody who isn’t an experienced rider. Likewise, somebody who’s going to be doing lots of A road riding will need a bike with a top speed in excess of 30mph otherwise they’re going to be in trouble. Be aware of the type of journeys you’re going to make and determine what your motorbike needs to be capable of. 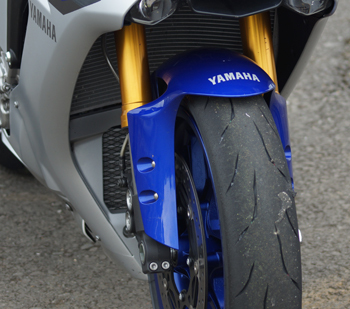 Fairings help with your motorbike’s aerodynamics and provide a buffer from the wind. Naked bikes – those without fairings – do not have this windshield and as a result buff you about much more which can be tiring over long, high-speed journeys. While this in itself implies that a bike with fairings would be safer because there is less windblast, it does mean that you will ride at faster speeds, as you don’t really get a true sense of how fast you are traveling. If you’re traveling short distances at low speed, a naked bike may be safer as they are more comfortable and windblast will not be an issue. If you will regularly travel long distances at high speed, a bike with fairings may be safer as it limits windblast. Windshields, as the name suggests, protect you from the wind and any other road debris that, if it wasn’t for a windshield, would hit you in the chops. Not all motorbikes come with windshields and only sport bikes come with them without fail, however they’re only short stubby excuses for windshields. They are designed to deflect wind up and over the rider and take any road debris over the same route, too. Windshields on other types of bike protect the rider by forming a, you guessed it, shield, with road debris hitting the shield itself rather than you. As a result, windshields are deemed safer because they stop road debris from hitting you and reduce windblast. You need to fit your bike. In the extreme, if you’re a tall rider, a small monkey bike is not the right bike for you and it would be dangerous to ride because of how uncomfortable it is and how difficult it would be to operate. Likewise, somebody short would not be well suited to a Harley-Davidson with tall, wide handlebars, again because controls could be out of reach. More obvious is the fact that your feet need to be able to touch the floor when you’re at a standstill – if you can’t do that on a bike you’re interested in buying then it’s not the one for you unless it can be adjusted. As a result you need to try a motorbike out and ensure that it fits you and that you can reach the controls, handlebars and the pavement comfortably. 1. Don’t mix tyre brands – keep the same type of tyre at the front and back. 2. Keep on top of pressure – make sure your tyre pressure is correct according to the manufacturer’s guidelines. 3. Tread depth – make sure your tyres have at least 1mm of tread across the middle three quarters of the tyre. 4. Original Equipment Manufacturers (OEM) – your bike will come with OEM tyres if you’ve bought it new. These are tyres made in conjunction with your bike’s manufacturer that are optimised to suit your bike. If you make sure that these four aspects are met then your bike will handle well however there are also some generalised schools of thought when it comes to tyre width and size. One says that the wider your tyre, the more friction it will create however that’s not true. The size or width of a tyre simply increases the contact patch between your tyre and the road surface, rather than friction. This provides more stability but will have downsides in terms of manoeuvrability. Slimmer tyres will give just as much traction but over a smaller area, meaning slightly less stability but much more manoeuvrability and tighter turning circles. Again, it’s important to be aware of the type of riding you will be doing on your bike and choosing accordingly however sticking with OEM tyres is an easy way to ensure your tyres are suited to your bike.